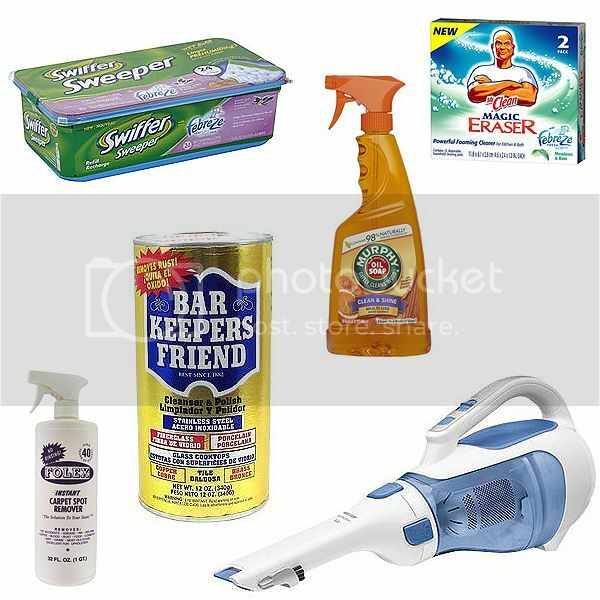 When you want to clean your home, it is much easier when you have the right products. Everyone has their store bought staples, and these are a few of mine. Essential Dustbuster: I do not know how anyone maintains a clean home on a daily basis without some variety of a Dustbuster, especially if you have kids or pets. I own the Black & Decker 14.4V Dustbuster Vacuum. It assists me when cleaning leaves from the floorboard of the car, hair on the bathroom floor, dust bunnies in the back of the closet, etc. Who has time to mess with a big vacuum when you have something small to clean up? Not me! Multipurpose Powder: I discovered Bar Keeper's Friend in high school when I tried to fix the marble counter in my parent's bathroom, which had fallen victim to a too hot curling iron. That was a long time ago, and this product is still close to my heart. It kept me from losing keys to the car back then and ensures my stove top stays shiny now. It really is a multipurpose product. Magical Sponge/Scrubber: The Mr. Clean Magic Eraser is the Chuck Norris of cleaning products. There is not much this product will not clean - do not taunt it. Years ago it was said that it was toxic, but it was proven to be a rumor. I scrub the shower walls, floor and faucet, while I am in shower. Naked. I feel like I should say "Towonda" ala Fried Green Tomatoes in my rebellion of using them in such close proximity to bare skin. You probably won't find this product in any Whole Foods, but the owners of Whole Foods probably have less magical cleaning results. Carpet Spot Remover: No clue what makes Folex Carpet Spot Remover so good, but it works. I do not have carpet, but it does the trick on all the rugs in my house. It also works on clothing, so have a field day with this stuff. Spots will disappear without having to scrub your arm off. I promise. Multi-Use Wood Cleaner: I started using Murphy Oil after noticing a bartender at my favorite watering hole wiping down their gorgeous wood bar with the stuff. You can now clean wood and counter tops without the greasy residue left behind with other wood cleaning products. The orange scent is a plus. Smell Good Floor Cleaners: I do not mop. That is not to say I do not support others who do. I just do not have time for it nor do I like the idea of a bucket of reused soapy water being used to clean my floors. I own a swiffer and it saves me time, and cleans just as well as traditional mopping. I love the Febreze Lavender & Vanilla variety, only to prove how big a sucker I am for good smelling stuff.